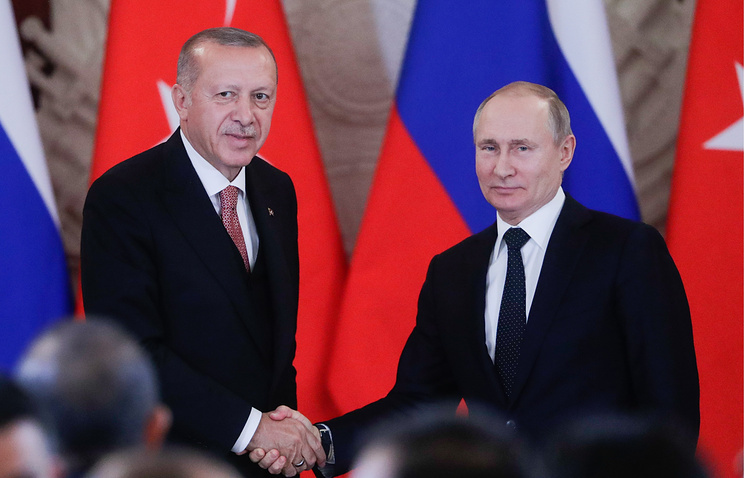 Russian President Vladimir Putin and his Turkish counterpart Recep Tayyip Erdogan discussed the situation in Syria and agreed to further ease visa restrictions at their Kremlin meeting, but their main focus was on economic cooperation between the two countries, Izvestia writes. The prospects for Turkish-Russian trade and economic relations look promising, said Turkish political scientist Togrul Ismail. Both countries are particularly interested in cooperation in the energy sector, the automotive industry and tourism. Putin pointed out at the meeting that Russia and Turkey are boosting ties between their foreign and defense ministries. In addition, defense cooperation is carrying on. 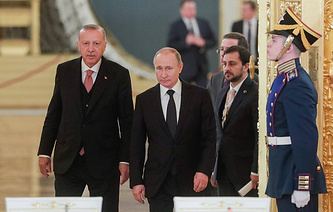 Despite the United States’ pressure on Turkey over the purchase of Russia’s S-400 missile systems, Ankara has no intention of abandoning defense dialogue with Moscow. Moreover, the two countries are actively working together to resolve the Syrian conflict and stabilize the situation in the Middle East. Russia, Turkey and Iran are playing a key role in resolving the Syrian crisis, Russian Federation Council member Alexei Pushkov said. According to him, it is up to these three countries to improve the situation in Syria, bring military activities to a full stop and build bridges to political dialogue. "Other countries are looking to Putin and Erdogan with great hope, believing that they are the ones who can iron out many of the regional issues," the senator told Izvestia. The Russian authorities have long understood, with whom they need to talk to in Turkey, expert Timur Akhmetov wrote in an article for Nezavisimaya Gazeta. However, in his words, "domestic political developments in Turkey have made it clear that the situation can change any time." "The logic of balancing has not yet taken root in Turkey’s diplomatic bureaucracy and since a change of elites is looming, bilateral relations will depend on other political interests," he noted. "The meeting makes it possible for the leaders of Russia and Turkey to once again compare their stances. However, it is attention to Turkey’s interests that should be the guiding principle of Russia’s policy towards Turkey rather than attention to the interests of the ruling elites," the expert emphasized. 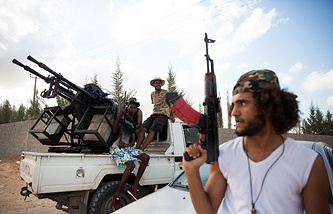 The Libyan National Army (LNA) led by Field Marshal Khalifa Haftar continues its offense against Libya’s capital of Tripoli, Vedomosti writes. According to the media, on Sunday, Russia prevented the adoption of a UN Security Council statement calling on Haftar’s forces to halt military activities. Moscow had allegedly insisted that the document should urge all parties to the conflict to put an end to the fighting. At the same time, Russia supported the UN Security Council’s press statement, which calls on the Libyan parties to end hostilities and search for a political solution to the crisis. On Friday, UN Secretary General Antonio Guterres visited eastern Libya but failed to persuade Haftar to stop the offensive. A US-sponsored conference involving the warring sides was expected to take place in mid-April but now it is unclear whether it will take place or not. Diarchy has been reigning in Libya for over five years. The LNA acts on behalf of a parliament based in the country’s eastern city of Tobruk, while the UN-backed Government of National Accord, recognized by the international community, sits in Tripoli. The Tripoli cabinet is supported by Italy, as well as by Turkey and Qatar, and it includes members of the Muslim Brotherhood organization. Meanwhile, the United Arab Emirates is Haftar’s main sponsor. The field marshal also has the support of Egypt, France and Russia. A thing to note is that he visited Russia last year. At the same time, Moscow continues to maintain contacts with the Tripoli government as well. As far as the formal balance of forces is concerned, Haftar’s LNA has the upper hand over its opponents because it has been receiving weapons and other equipment via Egypt for quite a while, the Arsenal Otechestva (Arsenal of the Fatherland) magazine’s Chief Editor Viktor Murakhovsky said. From a military standpoint, if the LNA forces succeeded in imposing a relatively long-term siege on Tripoli and defeated the militants that are active in Misurata, then they could win. However, according to a source close to the Russian Defense Ministry, the situation in the country is hardly predictable so a superiority in weaponry may not be enough. 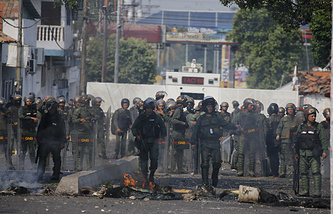 Attempts to stage a coup in Venezuela have failed, the country’s Ambassador to Russia Carlos Rafael Faria Tortosa told Izvestia. The fact that protests organized by opposition leader Juan Guaido have been attracting less people than they did before is proof of that. "Juan Guaido’s followers are not participating in rallies in his support, which testifies to the failure of the attempts to stage a coup," the Venezuelan ambassador said. "We are presented with photos and videos from when massive rallies were indeed taking place in Venezuela," he added. The country’s authorities and the opposition have come to a stalemate, Moscow State Institute of International Relations Professor Vladimir Sudarev told Izvestia. According to him, on the one hand, the constitutionally elected government still rules the country but on the other, its US-backed opponents are taking steps to undermine stability. It can go on like this for quite a long time, the expert pointed out. Electricity issues further complicate the situation. "[The power supply] is being gradually restored but it is a technically difficult task," the ambassador noted. "I cannot say that all issues have been ironed out or that the people are content with the situation. They are certainly disgruntled but they understand that it was an attack on our system," the Venezuelan diplomat emphasized. Despite the instability in Venezuela, Moscow and Caracas have managed not only to continue cooperation but also to boost it. First Deputy Chairman of the Federation Council’s Foreign Affairs Committee Vladimir Dzhabarov told Izvestia that the situation in Venezuela had not changed a thing for Russia. "We are working with the legitimate government, we have certain agreements and we are fulfilling all our obligations," the senator said. "The country’s President Nicolas Maduro was elected legitimately, while everything else is Venezuela’s internal affairs," he noted. Bombastic statements about the need to punish Russia for its alleged interference in the 2016 US election have stumbled into reality. 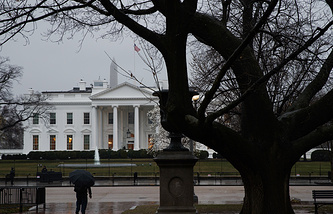 The US Congress has been losing enthusiasm for additional sanctions. However, experts do not consider it to be a good sign for Moscow, Nezavisimaya Gazeta notes. Republican Senator Marco Rubio and Democratic Senator Chris Van Hollen re-introduced the Defending Elections from Threats by Establishing Redlines (DETER) Act. The Defending American Security from Kremlin Aggression Act (DASKAA) has also been re-introduced. According to Bloomberg, many US senators are still willing to punish Russia but there is no clear consensus among them on how to send the right signal to the Kremlin. According to Program Director at the Russian International Affairs Council (RIAC) Ivan Timofeyev, it has become more difficult to make political gains from the anti-Russia crusade, which is why US senators show a lack of enthusiasm for a new wave of sanctions. "In 2016 and 2017, it was enough to say: ‘Down with Russia, let’s take measures against it,’ to score political points but now this is not sure to happen," Timofeyev said. In his view, there are two reasons for that. The first one is that Special Counsel Robert Mueller’s investigation has produced negative results, making it clear that there was no collusion between Trump’s campaign team and the Kremlin in 2016. However, Mueller said that there had been two cases of meddling in the presidential election, which involved a hacker attack of the Democratic National Committee and the activities of the so-called troll factories. "The Mueller investigation was the cornerstone for the campaign against Russia, as well as for the campaign against Trump. All newspapers wrote about it, everyone thought that the Mueller investigation is just a formality that will confirm everything but it didn’t," Timofeyev pointed out. In addition, he said that US lawmakers’ interest in Russia could have dropped in the wake of yet another investigation. "Even before Mueller’s report was made public, Trump ordered intelligence agencies to figure out if Russia had interfered in the US midterm elections. They found out that the US Justice Department had already issued a statement on that, saying that there had been no interference," the expert noted. Foreign markets have been attracting more Russian restaurant keepers recently. In particular, Russia’s takeout coffee chain Pravda Kofe (or Truth of Coffee) has started expanding to the CIS, opening its first locations in Kazakhstan. However, since the brand lacks recognizability outside Russia, it may run into hurdles in gaining a foothold on foreign markets, Kommersant notes. Pravda Kofe currently has about 70 coffee shops in Moscow, St. Petersburg and Krasnodar, including franchise locations. Beverages make up the bulk of its menu, which also offers pastries and snacks. An average bill comes to about 150 rubles ($2.3). The 2019-2020 strategy seeks the chain’s expansion in Russia and the CIS, a spokesperson said, adding that the company believes it is capable of opening dozens of locations in CIS countries. It has a franchise partner in Kazakhstan but is unwilling to disclose it. The network is currently testing coffee-to-go locations and traditional cafes with seating. The company is also in search of new partners in the region that would be ready to open five locations or more. In the past five years, Kazakhstan’s market has been very receptive to Russian projects, particularly those in the food and service industries, said Franshiza.ru expert Anna Rozhdestvenskaya. According to her, the number of Kazakh investors who seek franchise partnership has been growing. As for Russian coffee shops, the Double B network is also going global. According to its website, the chain already has locations in Dubai, Barcelona, Prague and Tbilisi. According to Infoline-Analitika Director General Mikhail Burmistrov, a lack of brand recognizability is one of the main problems a chain may face when entering a new market. It may also need to adapt its products and pricing policy to local conditions. Besides, the coffee-to-go service is only just emerging in CIS countries and is not as popular as in Russia, the expert pointed out.